3M LVI-3/x hazardous area resin cable joint kits are designed to be used for multi-core, armoured polymeric, LV energy cables in hazardous areas – the cable joints are suitable for both wire braided (galvanised steel wire braid GSWB) and wire armoured (galvanised steel wire armour SWA) cables, including XLPE and PILC cables with lead sheath. 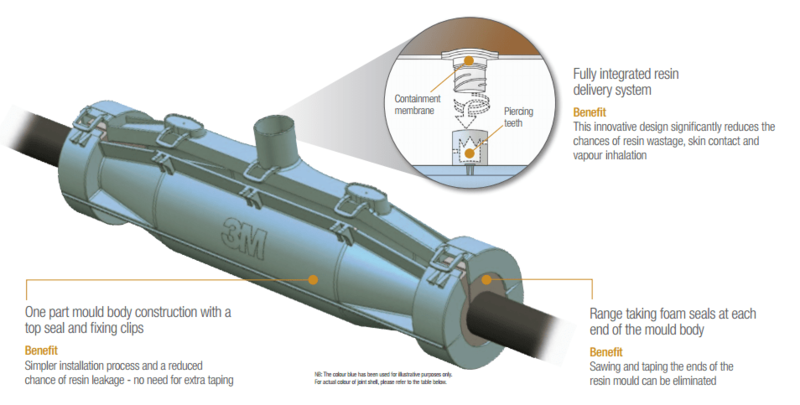 3M LVI-3/x hazardous area cable joints incorporate electrical insulation and mechanical protection and are compatible with both compression (crimp) connectors or mechanical shearbolt connectors for conductor jointing of copper or aluminium cores. Jointing kits can be used for indoor and outdoor, underground direct burial and submerged applications in both hazardous area and non-hazardous area locations – straight and transition joints (jointing dissimilar cable insulation types) including EPR, XLPE and PILC cable are available where hydrocarbon resistance is required due to cable and joint exposure to aggressive flammable gases, vapour or liquids in the onshore and offshore oil, gas and petrochemical industry. Due to their chemical formulation, Cold Pour Electrical Scotchcast resins can decay in the presence of hydrocarbons or chemical solvents. The polymer chain “backbone” of the cable jointing resin is attacked and, once broken by hydrocarbon or chemical solvents, the resin will revert back to its original liquid components. 3M Electrical test results show how different resin types are affected when immersed in either petrol/diesel or a highly aggressive combination of chemical solvents. Rapid deterioration is most clearly pronounced in low cost, standard polyurethane (PUR) resin. Epoxy resins offer better performance over these low cost cable jointing resins, but can also be adversely affected when exposed to some of the test liquids. 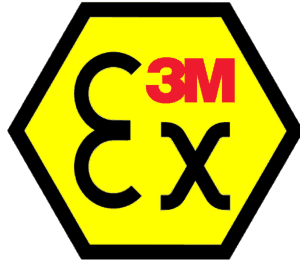 3M 1402FR high quality, highly modified polyurethane resin, demonstrates superior performance above all the other resin types – 1402FR resin is supplied in the range of 3M hazardous area cable joints covering instrumentation, control cables and power cables rated up to 3.3kV. ➡ Read our Blog for further information about the selection and specification of cable joints according to the ATEX Directive. 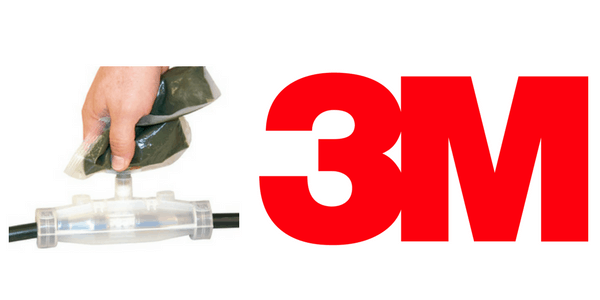 3M Scotchcast LVI-3/X resin inline or straight cable joint kits are supplied with a one part translucent mould body for simple and easy handling. Distances inside the cable joint body can be checked easily. 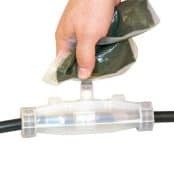 The re-openable seam and integrated spout with a membrane provides a 3M Closed, Mixing and Pouring (pictured) cable jointing system. 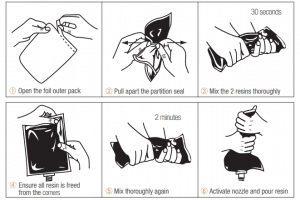 After the seam of the two chamber bag is opened, the Scotchcast resin components can be mixed. The following table enables the selection and specification of hazardous area cable joints according to the 3M Scotchcast LVI3 range: cable joints are suitable for both air installation locations in potentially explosive atmospheres with flammable gases/vapours or direct burial in underground cable trench with hydrocarbon contaminated soils and ground conditions. 3M LVI-3/x Scotchcast resin cable joints are tested according to EN50393. Please note: Scotchcast LVI-3/7 and LVI-3/8 cable joints will have a shelf life of 12 months as they use a higher volume of resin with different packaging to the smaller cable joint kits. Thorne & Derrick International have supplied 3M Scotchcast Resin Cable Joints utilising Scotchcast 1402FR resin to joint Prysmian FP600S cables at the Birmingham New Street Development Project for Network Rail. The 3M Scotchcast Resin Joints type LVI3/8 were supplied to cable joint Prysmian FP600S 4 core 300sqmm cables – the cable joints were supplied complete with mechanical shearbolt connectors to enable fast and easier cable jointing of sectoral conductors without resort to crimping tools and die sets. 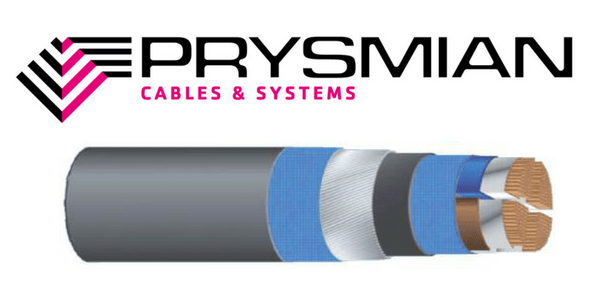 FP600S manufactured by Prysmian is the ultimate fire resistant, armoured cable for power and control of emergency, life safety and fighting systems. FP600S has been developed to meet the highest possible level of fire resistance for this cable type. FP600S also meets or exceeds low fire hazard requirements of LSOH cable.